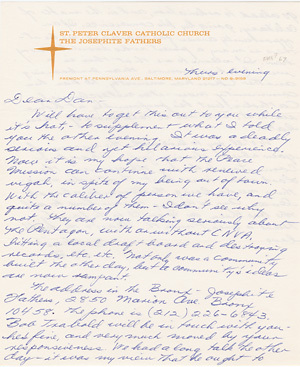 In the letter to his brother Dan, Philip Berrigan reports on his activities with the Peace Mission while living with the Josephite Fathers community in the Bronx and the latest news concerning both of them. serious and yet hilarious experience. vigor, in spite of my being out of town. 10458. The phone is (212) 226-6843.